Heart's Delight Cards: Last Card.....No, Really! My inspiration for this card came from Yapha Mason's card posted a couple days ago. As soon as I saw it, I knew it would be perfect for a friend of mine who is a breast cancer survivor. She is into all things pink, and I know she's going to love this card! This is pretty much a direct copy. 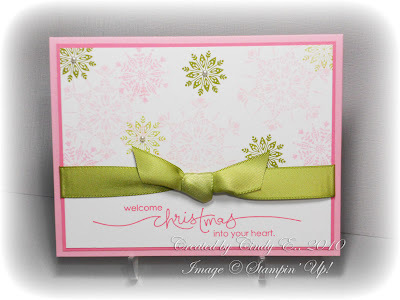 The only changes were the sentiment, and instead of Melon Mambo, I used Regal Rose. Thanks for the inspiration, Yapha! Gorgeous!! Love your version of it! It's just a spectacular card, all the way around! So pretty! Love the unusal colors. So pretty! A great design is hard to beat. You can bet I'll be CASEing this design to make the Thank You cards for all the good wishes my Mom has received for my Dad.